“The report could incite violence against immigrant communities”, SADA (M) Canada claimed. “It has been two months since Min Ralph Goodale told a community delegation that they will review the report but nothing has been done. 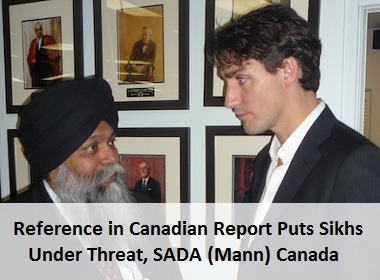 The poisonous “2018 Public Report on the Terrorism Threat to Canada” terms Sikhs (Khalistani) as extremists without factual backup”, said SADA (M) Canada East president Sukhminder Singh Hansra. “I must reiterate that the “2018 Public Report on the Terrorism Threat to Canada” is causing frightening concerns for the Sikhs in Canada”, he added. “Since Min Goodale has been unsuccessful to share proof of Sikh extremism, meanwhile the report is spreading hate against Sikh and other communities which are wrongfully included in the report”, said he. “In the light to Christchurch New Zealand terror attack at two Mosques which killed 50 Muslims while praying; we urge the Government of Canada to immediately act on “2018 Public Report on the Terrorism Threat to Canada” with our demand prove it or remove it”, he added.